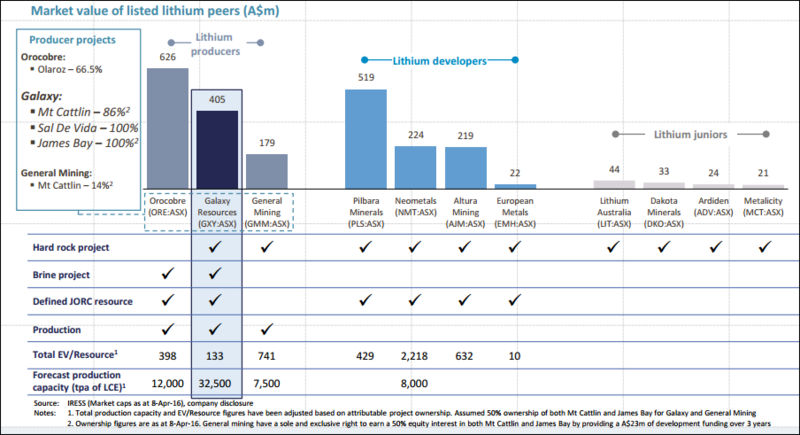 Disclaimer: The data on Australian-Lithium.com is intended as a guide only and is provided purely as an indication of what information can be found through official announcements. Data on this website should not be used to make an investment or trading decision. All information should be carefully cross-checked against official sources for accuracy. The publisher (Intaanetto.com) will not be held liable for any loss arising from the use of this website. Persons associated with Intaanetto hold one or more of the stocks mentioned on this page. Please note that this is a rapidly changing field and that the data contained will inevitably be out of date some of the time; meaning that you should not rely on it to make investment decisions and consequently you must do your own research. 25.16mt at 1.23% for 309,431t - Pilgangoora project Port Hedland-Pardoo-Marble Bar: Shallow, hard rock spodumene lithium (Li) deposit. Sal De Vida - Argentina ~ A maiden JORC-compliant Reserve estimate of 1.1 million tonnes of retrievable lithium carbonate equivalent and 4.2 million tonnes of potassium chloride (potash or KCI) equivalent.... Galaxy controls 100% of the brine mineral rights over more than 385 square kilometres on the eastern half of the Salar del Hombre Muerto. The western half of the Salar is the site of Argentina’s only commercial scale lithium mining operation owned by Minera del Altiplano, a subsidiary of FMC Corporation. The Fenix operation has been producinglithium since 1997 and according to FMC’s website has a mine life of over 75 years. James Bay, Canada ~ Contains indicated resources of 11.75 million tonnes grading at 1.30% Li2O and inferred resources of 10.47mt grading at 1.20% Li2O. PLS’s flagship asset is its Pilgangoora Lithium Project in WA. The company to date has determined a JORC Resource of 80.2Mt at 1.26% Li2O, equivalent to 1.7Mt of contained LCE. Pilgangoora is the world’s 2nd largest hard rock lithium deposit, ranking only behind the world class Greenbushes mine. Compared to other emerging hard rock lithium producers, Pilgangoora ranks above average in terms of size, grade, and costs, as well as demonstrating favourable metallurgy to date. Disclaimer: The data on Australian-Lithium.com is intended as a guide only and is provided purely as an indication of what information can be found through official announcements. Data on this website should not be used to make an investment or trading decision. All information should be carefully cross-checked against official sources for accuracy. The publisher (Intaanetto.com) will not be held liable for any loss arising from the use of this website. Persons associated with Intaanetto hold one or more of the stocks mentioned on this page.